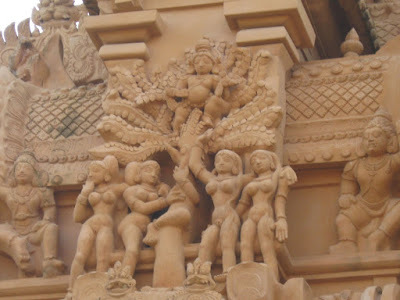 Thanjavur – it was a jungle when the Cholas decided to make it their capital. They not only built what was to be their signature-temple here, they made it the centre of their cultural and literary activities. 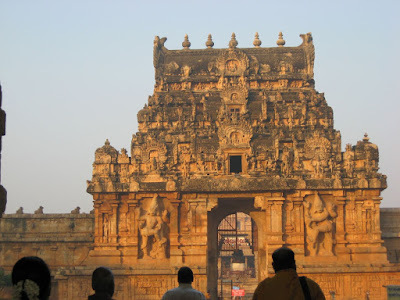 Their temples were built not just for prayer and religion, but they were also the seat of the fine arts – music, dance, sculptures and paintings – and also their records, which were etched on the walls of these temples. 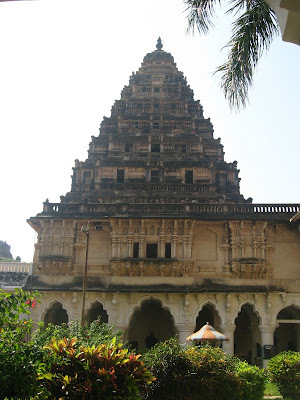 The Brihadeeswara temple (now popularly known as the Big Temple) was built by Raja Raja Chola. 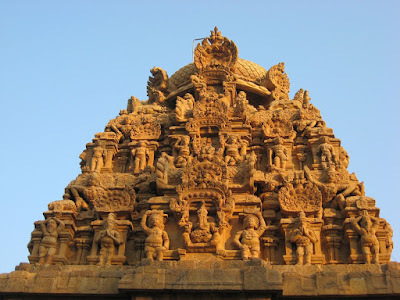 His son, Rajendra Chola celebrated his conquest of the north right up to the Ganges, by building Gangai Konda Cholapuram. 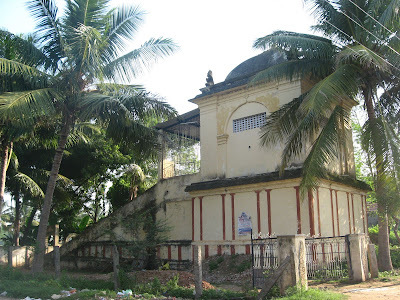 The grandson, Raja Raja II is credited with the grand temple at Dharasuram. 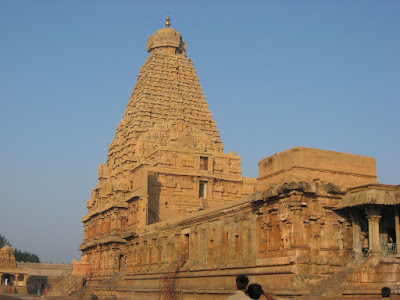 These 3 generations of Cholas greatly enriched this land now known as Thanjavur. Later rulers, the Pandyas, Nayaks, and the Mahrattas left their own marks on this city, making it what it is today. We made two visits to Thanjavur during this trip – the first was on the 27th October, when we visited only the Brihadeeswara temple. We returned for a second, more leisurely visit on 2nd November, when we visited the museums and other temples. For simplicity, I shall now deviate from my diary style of writing day to day, and focus on temples according to their group or according to the city. Fittingly known as the Big Temple, this is truly an architectural marvel, which has now been included in the list of World Heritage structures. Much has been written about this temple by others who have studied it in more detail than I have, so I shall stick to writing simply about what I saw there. At the very first glance, the temple attracts you with its stone spire reaching to the sky. 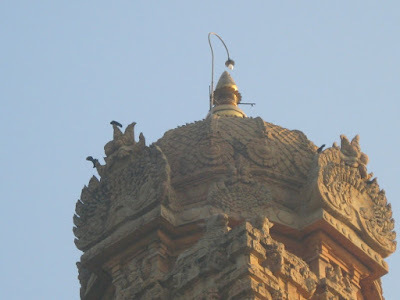 It is even more impressive with the knowledge that the top of this gopuram is made with a single stone, which was carted to its place with much effort and ingenuity. The carvings on every piece of stone, from the first gate to the last bit of stone on the roof have been made with love and precision, not to mention immense talent. The first thing you notice when you enter the temple is the immense Nandi, who stands guard over the abode of his lord. According to folklore, this Nandi was carved outside the temple premises, and was brought to the site only when the temple was ready. Imagine the anguish of the architect when he realized that his piece-de-resistance would not enter the gate of the temple it was built for. The entrance way was much too small for a Nandi of this size, and they seemed to have no option other than breaking down the archway, which none had the heart to do. 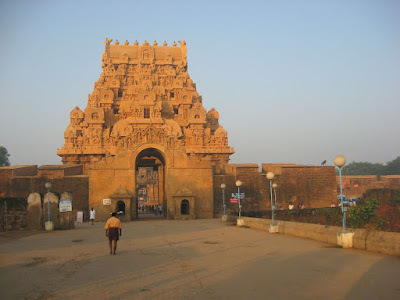 Thankfully, the king had a brainwave, and he invited the Karur Siddhar (the saint who had selected this site for the temple, as well as advised him about building the temple) to find a solution to this problem. 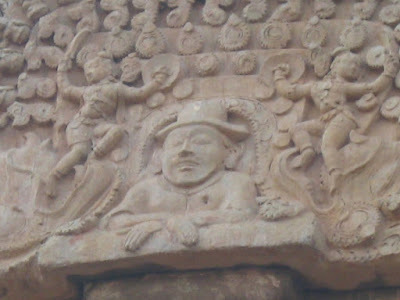 The saint simply brought a paste made of some herbs and applied it on the Nandi. Imagine the surprise of all when the Nandi, made of solid stone, passed through the archway without injury to itself or the arch!! As a tribute to the saint, there is a temple dedicated to him in the temple pragaram. One of the interesting things about the temple is the insight it gives about the king. Raja Raja Chola has been said to have been generous, and he must have had a great urge to leave something behind to distinguish him. This is apparent from the size of the temple and its grandeur. This grandeur is further reflected in the size of the idols. Every idol here is huge, to put it simply. 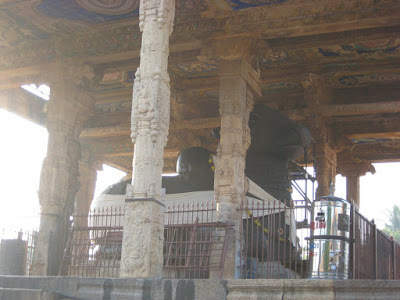 The size of the Nandi can be estimated from the photographs. 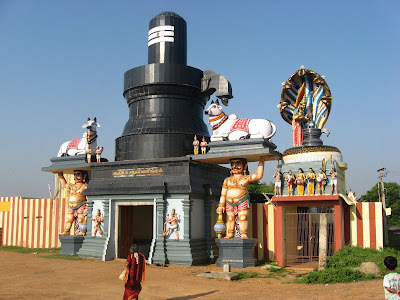 The Shiva lingam in the main temple – Brihadeeswara is much, much bigger. So are the idols of the other gods, such as Shanmugha, or karthikeya, the 6-faced son of Shiva. 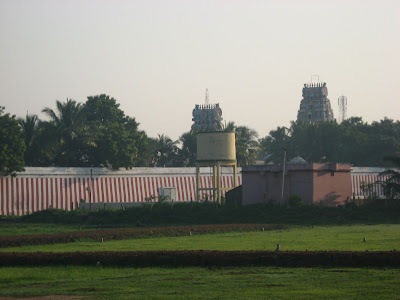 Here is a photo of the temple dedicated to Shanmugha. 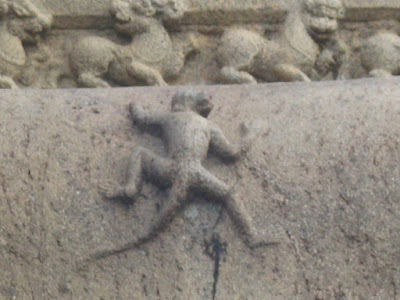 On the roof of this temple is this carving of a monkey appearing to climb the roof, which is remarkably lifelike. 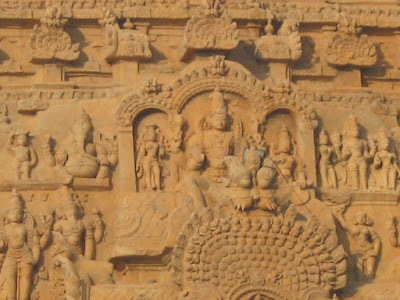 Here are a few more carvings from the gopuram of the main temple. The first one is of a westerner who happened to arrive when the temple was being built. He was deeply impressed by the architectural talent of the Cholas and the king too was impressed by the foreigner who showed so much interest. 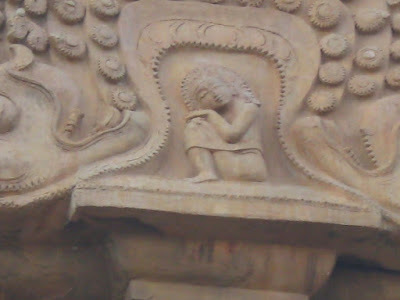 This man and his wife are immortalized in stone on the gopuram of this temple. 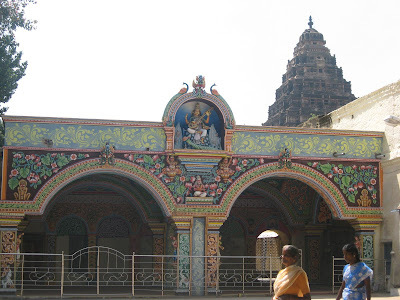 This temple dedicated to Mariamman, a manifestation of Shakti, is about 5Kms from the Brihadeeswara temple. 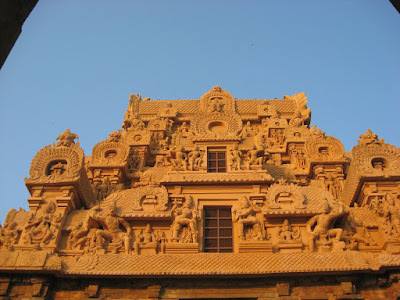 This is also one of the temples built by Raja Raja, as a sort of guardian deity of this area. 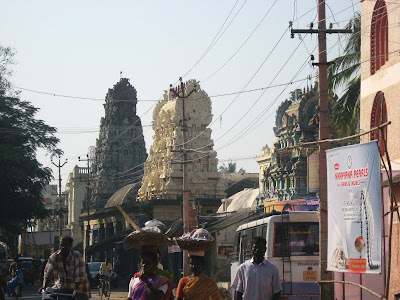 The road to the temple leads us along a canal of the Kaveri, which is called ‘sagaram’ or sea. According to folklore, one of the Chola queens, who had never seen the sea wanted to sail on the sea, and experience the waves. At the same time, they were afraid of the sea itself, because of its unpredictability. After much consideration, the king hit upon an idea – he decided to build a canal from the Kaveri River, lining it with stones in such a way that when the queen went by in a raft, the action of the punt resulted in artificial waves. This temple is much frequented by locals, for the deity is said to be extremely powerful, and is credited with healing powers. Sundays especially are extremely crowded, but special darshan tickets for Rs.5/- are available, which speed up the darshan time considerably. 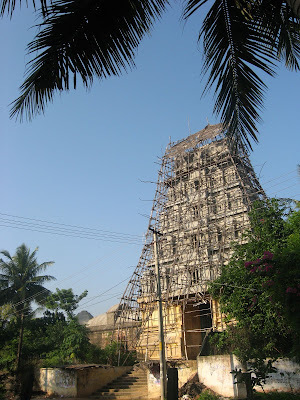 The Kothanda Rama temple is very near the Punnainallur Mariamman temple. According to a legend, after a victory, Raja Raja was gifted 4 huge Saligramam stones by a ruler from the north. Not wanting to keep the stones as they were, he ordered them to be carved into idols of Rama, Lakshmana, Sita and Sugreeva. Interestingly, it is Hanuman who always occupies the fourth position with Rama, Lakshmana and Sita. This is probably the only temple where Sugreeva fills his place. Of course, Hanuman is in attendance here too, but in the form of the Utsava moorthy along with the others. The idols alone are worth a visit to this temple, for the beauty with which they have been carved has to be seen to be believed. As one stands in the sanctum, one feels as if Rama and Lakshmana will walk out at any moment! Just outside this temple is another one dedicated to Hayagriva, the god of learning. The idol of Hayagriva, the horse faced lord is small, but is perched on a temple reached only by a staircase. At one time, this was probably a part of the larger Rama temple. This is one of the newer additions to the city, a temple built with the idea of bringing almost all the gods under one roof. To me, a new temple doesn’t seem as attractive as any of the older ones, but Samhith enjoyed this temple a lot, especially since the gopuram had a huge lingam and an image of Parvati praying to it. 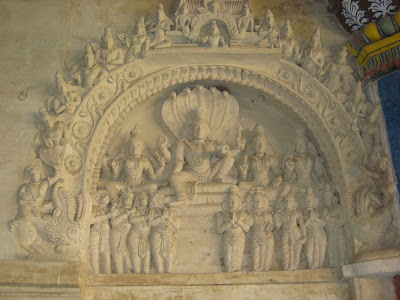 He was even more impressed at the carvings of the Dashavatarams, and Nava Durgas inside the temple. This is a nice temple, but certainly not in the league of the other temples in the area. 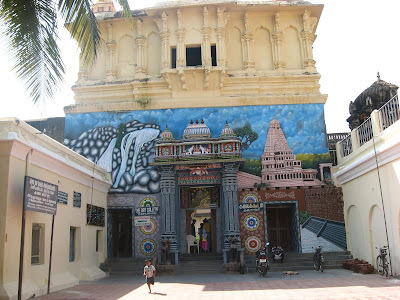 Adjacent to the Bangaru Kamakshi Amman temple are three other temples – the Vijaya Rama Temple, the Navaneetha Krishna Temple and the Pratapa Veera Anjaneya temple. All these are fairly big temples, considering that they are in the heart of the commercial par of the city, and are calm and peaceful, certainly worth a visit. 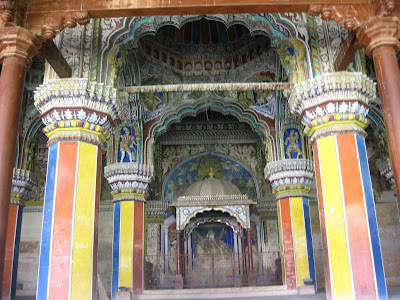 Also worth a visit is the Samadhi of Kongana Siddhar, one of the 18 Siddhars, saints who attained salvation. The palace of the erstwhile Mahratta rulers of Thanjavur has been converted into a museum, displaying many beautiful statues in stone, brass and bronze. One can climb right to the top of the tallest tower, from where one can get a good view of the whole city. It is also possible to climb the bell tower for a fee. Different sections of the palace have been converted to museums displaying a variety of articles, but what is lacking is a uniting factor. Every section has its own entrance fee as well as camera charges, which finally drains ones purse. The durbar hall is worth a visit for the exquisite paintings and sculptures. One can imagine what the place would have been like at the height of its glory! 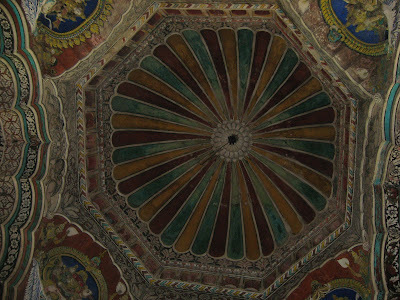 Thanjavur is famous for the paintings with gold foil and semi precious stones, which have come to known by the name of the city – Thanjavur Paintings. These paintings are available at the store in Saraswati Mahal. To get a feel of how these paintings are made, you can go to the South Street (Therku Veedhi), where you can visit one of the antique shops or visit one of the dealers who works from home. Thanjavur “Thalai aati bommais” – dolls which nod their heads – are another specialty of Thanjavur. These are available outside the Brihadeeswara temple as well as the Punnainallur Mariamman temple. 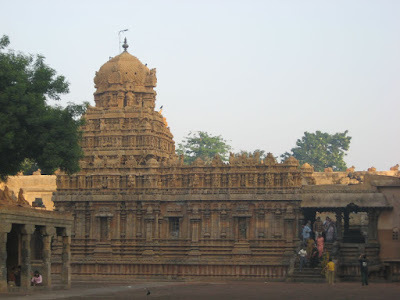 Thanjavur is a fascinating city that makes you want to spend more time there. We spent just about a day there, and though we managed to see most of the important things around, it was like we were just getting a feel of it. I yearn to go there again at my leisure, and spend hours looking at the Big Temple. I also wish I had paid more attention when my mom painstakingly taught me to read and write Tamil. Today, though I can speak Tamil fluently, I can only read with an effort, and cannot write at all. If only I knew to read Tamil better, I would be able to read all the wonderful manuscripts and books at the Saraswati Mahal library. 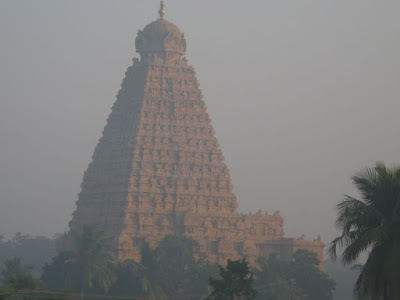 As we moved to the other cities and temples on our itinerary, it was with a silent prayer to God that he would bring me back here at least a second time……. The pictures here of the Saraswathi Mahal library remind me of Jaipur; esp the City Palace there. Have you been to Jaipur? Very very well written and informative too!! !